The action-packed film Force 2 is all set to spread some thrill on the silver screen on November 18. The action-packed film Force 2 is all set to spread some thrill on the silver screen but before that, the team is doing all that it takes to promote their film. 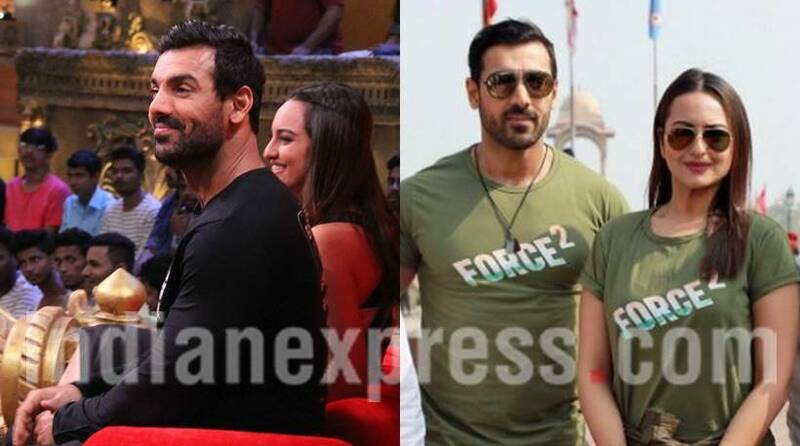 The actors of the film, John Abraham and Sonakshi Sinha, recently appeared on the sets of Comedy Nights Bachao Taaza to get some comic relief before they get into the extensive promotional spree in order to attract the audience on November 18. Bharti Singh, one of the comedians on the show, will take them on a Bachao ride. Even the pictures reveal how much fun these two are having on the show. John Abraham, who looks a tough and no-nonsense guy, is seen in splits in a lot of pictures while Sonakshi is participating in Bharti's act quite sportingly. The filmmakers chose a unique way to begin the promotion of their film. They had flown to Delhi in order to pay tribute to the Indian jawans. In fact, they made sure to feel like one while their visit to India Gate, as we could see them dressed in fatigues with Force 2 written on their T-shirts. Well, that was quite a different way of creating a buzz around their film. We also saw Tahir Bhasin on Comedy Nights Bachao. The actor, who plays the antagonist in the film, has been hardly seen during the promotions of the film. The actor was earlier seen in Mardaani, opposite Rani Mukherjee. This is the first time that audience will see Sonakshi and John sharing the screen space. Sonakshi, who is setting high standards of action for other female actors in the industry, will be seen playing the role of a secret agent. John, on the other hand, is reprising the role of ACP Yashvardhan. Force 2 is a sequel to 2011 film, Force. The film is directed by Abhinay Deo and will release on November 18, along with Tum Bin 2.